The four-story structure is approximately 70,300 sq. ft. and contains 228 beds in two and four-person units as well 300 new parking spaces. Amenities include a new fitness center, laundry facilities, common areas for students, and accommodates both ADA and Non-ADA students. The building was constructed using structural steel, brick veneer, curtainwall, prefabricated wood wall panels, a fluid-applied weather barrier, and storefront assemblies. This project is LEED certified. 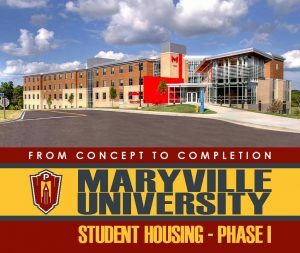 See the complete construction process from start to finish and everything in-between for Maryville University Student Housing Phase I.